Since 2005 the Estonian Ornithological Society and the Eagle Club have placed satellite and GPS receivers on seven adult birds and one young bird. Receivers are placed on the birds primarily for the purpose of researching the species and organising protection. 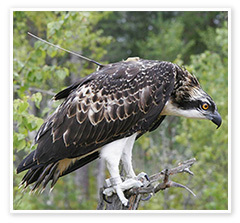 Birds who have received valuable “backpacks” include black storks (3 birds), greater spotted eagles and ospreys. All of these birds have also been named. The GPS telemetric monitoring of ospreys takes place with the support from Eesti Põlevkivi Ltd. and State Forest Management Centre (RMK). The female bird that is called Maria was caught from the nesting site with eaglets closest to the Narva grand pitch. Two Estonian black storks were provided with satellite transmitters at the beginning of July in 2005. In the course of the whole project (Flying Over Nature 2000) 20 black storks from different countries in Europe were provided with transmitters. Mart represents the true bred greater spotted eagles of Estonia which is proven by his appearance as well as DNA. We managed to catch Mart and place a transmitter on him on 29 August 2006. Juku – the first bird in Estonia that received a GPS transmitter – is a greater spotted eagle. In 2005 we received new information about the use of feeding sites, beginning of migration and migration. Juku was caught on 15 August 2005 in Raplamaa; he had at the time 2 eaglets. Juku died probably in December 2005 during migration in Serbia. Teele received her monitoring device on 24 September 2006 in the northern part of Viljandi County. When she was caught, she might have already been migrating and may thus not come back to the place where she was caught.